I'm sorry for my lack of posting over the last two weeks. It's a busy time. Life is flying past in a blur. I often think about why it seems that each year goes faster than the last. Is it because most of us are doing the same thing day in day out? Because life is not as new and unfamiliar as it was growing up? I had a conversation with a friend a few months ago about this topic and he said to slow his life down, he did one new thing a week, even if it was as mundane as walking a different way to work. Sometimes he'd go to the symphony, go for a run in the park instead of the gym, or eat somewhere new for breakfast. Doing something different, no matter how small, gave him a kind of placeholder in his mind so he could distinguish each week from another. My friend's name is 'Lamby' and I'm dedicating this recipe, a Lebanese lamb kofta salad, to him. I hope this week stands out in his recollections as a special week. The lamb kofta salad is a dish I ate during my recent detox diet. 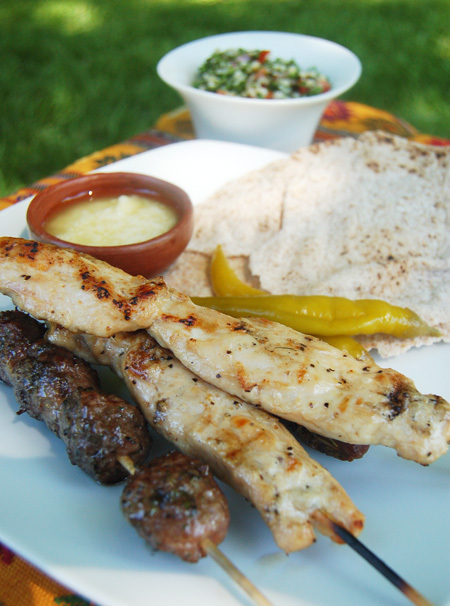 I have a real weakness for Lebanese food, especially a garlic sauce often eaten with barbecued meats. I first tasted it in a small Lebanese restaurant called Fatimas in Sydney. I've tried on many occasion to replicate the creamy concoction but I never get it just right. I do come pretty close though. The sauce is a combination of TWO garlic bulbs (yes, I do smell of garlic for the next two days), olive oil, lemon juice and sea salt. It's fantastic smeared over lamb, chicken, beef, white fish and in salads. Just don't kiss anyone.